#MSWL -- lyrical & melancholic voices. I love stories that are sad without being bleak. 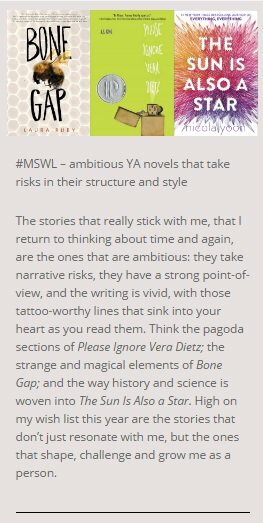 #MSWL - lyrical middle grade and young adult; stories where the language bowls me over. #MSWL - YA contemporary that is funny and has the anything-is-possible energy of our teenage years. #MSWL - middle grade with big worlds that readers will want to escape into.